The search for spiritual awakening can create a deep rift within us if we develop an aversion to our feelings, longings, and humanity. 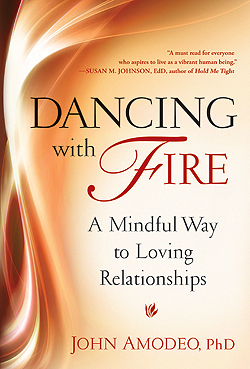 This highly acclaimed, practical book offers a path to mindfully engage with the fiery emotions and desires that relationships bring up for us. It explores how emotionally fulfilling relationships and spiritual development are two sides of the same coin of awakening. Bridging attachment theory with Buddhism and other spiritual paths, the book explores how weaving together mindfulness with Focusing creates a climate that connects us more deeply with ourselves, others, and life itself. Profoundly wise and beautifully written, this book is for anyone who ever wondered how to reconcile the spiritual journey with the paths of self-healing and intimacy with others. A gifted writer at the top of his form, John Amodeo’s book is not just about authenticity and connection, it actually offers those experiences as one reads. A life-changing book.